Merry Christmas, Baby. Photographer unknown. circa December, 1965. Several years ago my mother gave me this big manilla envelope stuffed fat with a bunch of photos from all through my childhood, along with report cards, birth announcements and all manner of other mementos. There’s stuff from the day I was born all the way up through my late 30’s, when I was living in NYC. In fact, many of the photographs are ones that I myself shot, and then sent her and Dad some prints. I was a little hurt, at first, that my mom seemed to have absolutely no need for these little markers of my life, these frozen moments. And not just me, but the life of the whole family, really, because they weren’t just pictures of me, they were of my siblings and cousins, high school friends. Now I know that she just got tired of keeping stuff around. In addition, she must have known, either intuitively or consciously, that I would do something with them eventually, perhaps something useful or creative. She was right. I’ve gone through them several times over the years, and have in mind to get them all scanned at some point, and archive them digitally, as we do these days. But it has to be said, she got rid of them because they were taking up too much space. She had no need for these old snapshots anymore. I was looking through them again, just a little while ago, to see how far back I could reach for a photo of the family having Christmas. 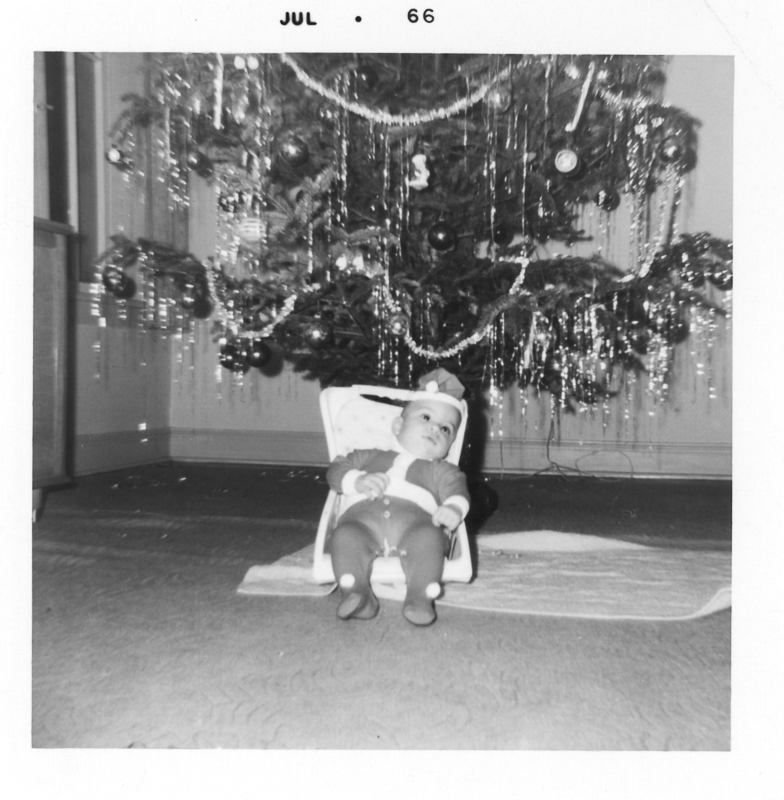 There’s a black and white one, marked by the lab with July of 1966, showing a baby in a carrier under a Christmas tree. I know it isn’t a picture of me. The date on the print precedes my birth. It could be my older sister, Sue, who would have been a little over 1 year old. The baby in the picture is pudgy, though, and Sue claims she was a small baby. In any case, whoever took the picture procrastinated for at least six months before developing the film. Which doesn’t indicate anything, really, except as possible circumstantial evidence that I am connected, by genes, to the photographer. Also, there’s a notable lack of presents under the Christmas tree. The author with a new toy. Photographer unknown. December, 1975. The author with his first new television. Photographer unknown. Circa 1980. It struck me, in looking through the pile of disorganized and aging snapshots, that my family took most of our photos at Christmas. There’s the requisite number of travel pictures, of course, and family reunions, and proms, etc. But more than anything, there are holiday pictures. And of these, the bulk of them are the family holding up all of our new stuff. 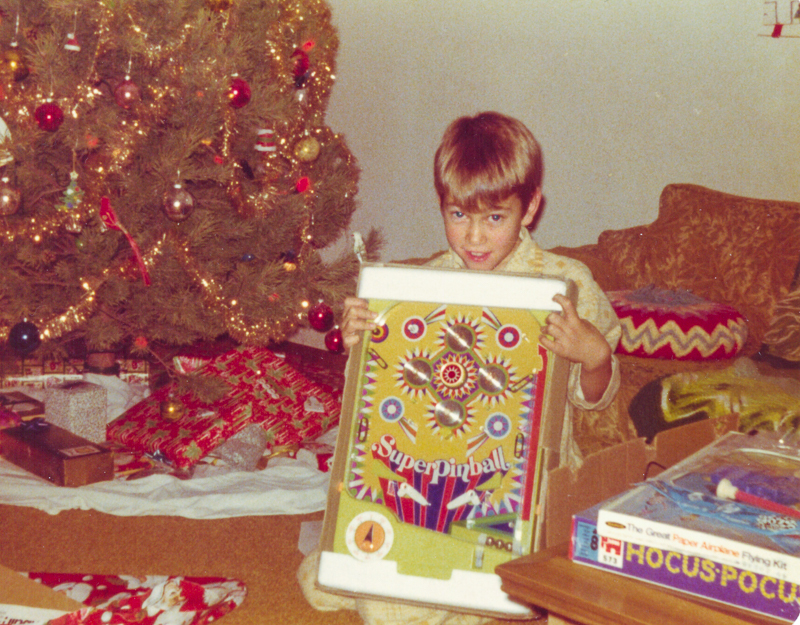 There’s one of me when I was around 9, holding up some kachinka pinball machine I had just torn open on Christmas morning. There’s me with a watch or something when I was 15. 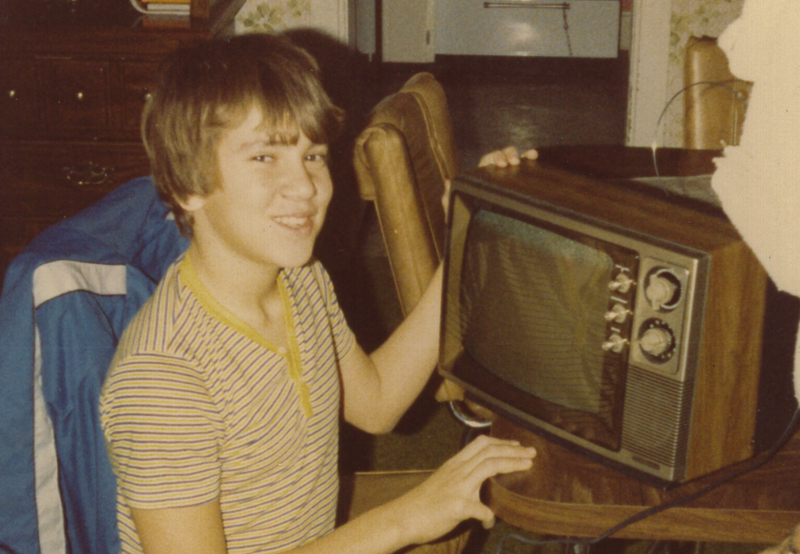 Me and my first television at age 12, a new sweater at age 25, a team jersey when I was in high school. Both of my sisters have families of their own now, and most of the younger children have grown up, so the family doesn’t do the whole gift-giving extravaganza the way we used to. I’m not saying there’s anything wrong with it, per se. Without getting into the tired but valid complaints about the over-commercialization of the holidays, there is something pure about the impulse to be generous with each other during this time of year. 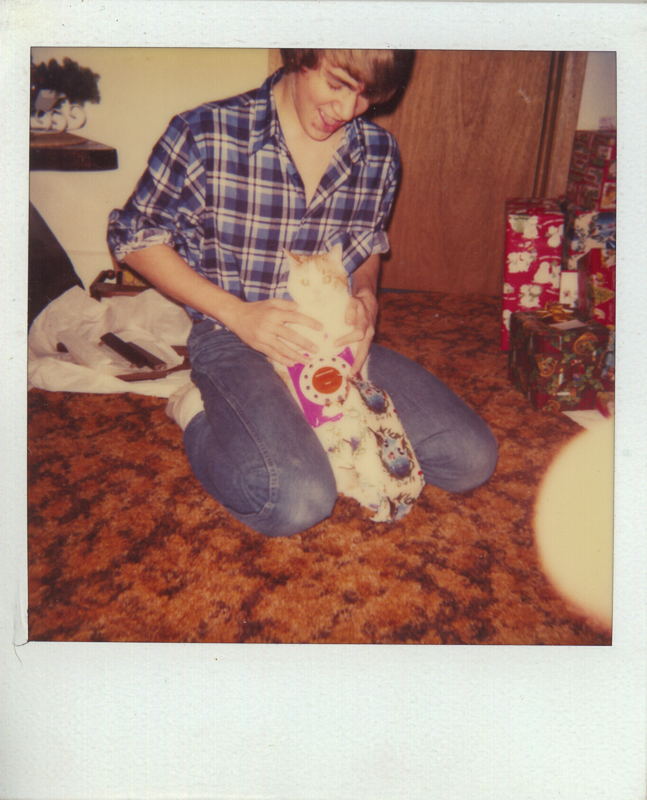 The author with gift and a kitty. I’ve forgotten her name. Circa 1982. My family doesn’t even get together, all of us, every year. It seems to happen about once every other year, if that, and as I get older, I kind of miss that part of it. Not the exchanging of presents. Just being around the family. This year I’m working in a bar on Christmas Eve, and Christmas Day too, and most of my family is celebrating Christmas in their own parts of the world, with their own families and their own gift-giving, and their own family snaps. 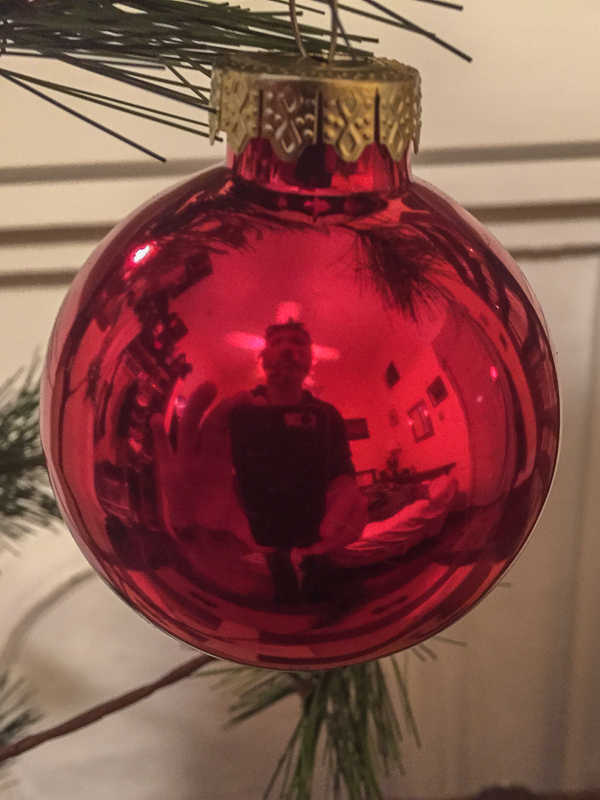 Self-portrait with my new iPhone 6. 12/24/2014. Format: digital via iPhone 6. Christmas doesn’t hold the religious connotations for me at all, but that’s been the case for many years. And it’s not that it doesn’t mean as much as it used to. In some ways it means more. It could just be a feeling of nostalgia that I get when I look at these old snaps. It might just represent the warm comfort of being with friends and family at this time of year, and holding up that new toy I just got, or putting my arm around that new friend I just found, or flipping through old snapshots and remembering all the things this time of year has given to me.